Each “company” is comprised of two students who work together to test and diagnose engines that are not functioning properly in order to determine if the engines can be reconditioned or need replacing. 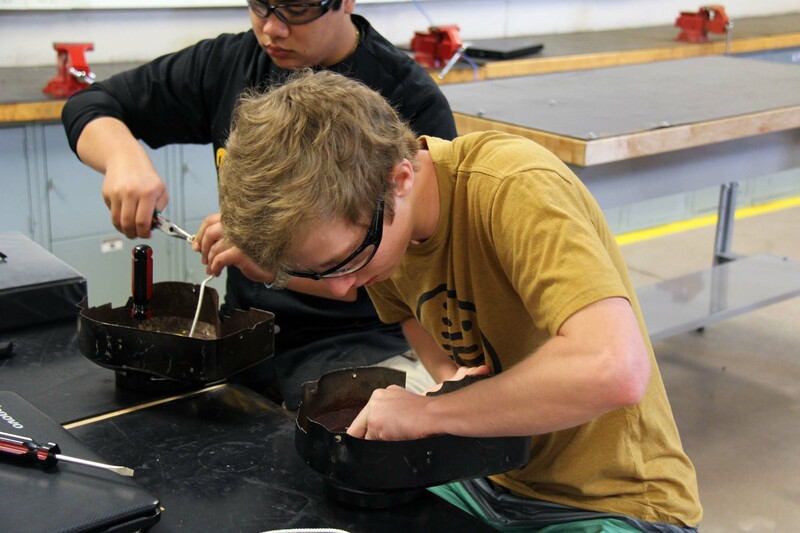 Kennedy’s students graduate to performing engine evaluations only after their companies complete initial tasks that build in complexity, beginning with disassembling engines, measuring parts and restringing a rewind motor. Nick Fallejo and Carter Smith practice restringing rewind motors. The companies’ clients are family members and other individuals from the community who have submitted walking mowers and other lawn and garden equipment for students to evaluate and return. By mid-April, Kennedy had 275 items in the inventory, and his students will document and explain their findings on work orders for each evaluation they complete. To support this authentic learning experience, Kennedy was awarded a Virginia Beach Education Foundation (VBEF) grant funded by Thompson Consulting Engineers. A previous VBEF grant Kennedy received was used to buy extra sets of industry-standard tools such as tachometers, torque wenches, sonic cleaners, compression testers and leak down testers, to ensure students were not waiting on tool availability in their respective “companies.” This year’s grant, Kennedy explained, was used to purchase a STIHL technician’s toolbox that includes specialty tools for working on STIHL equipment as well as other manufacturers’ two-stroke equipment. “STIHL has also been gracious enough to open up their technician website to us. The students are all logged on as technicians, and they have access to everything that the guys in the field do,” Kennedy added. 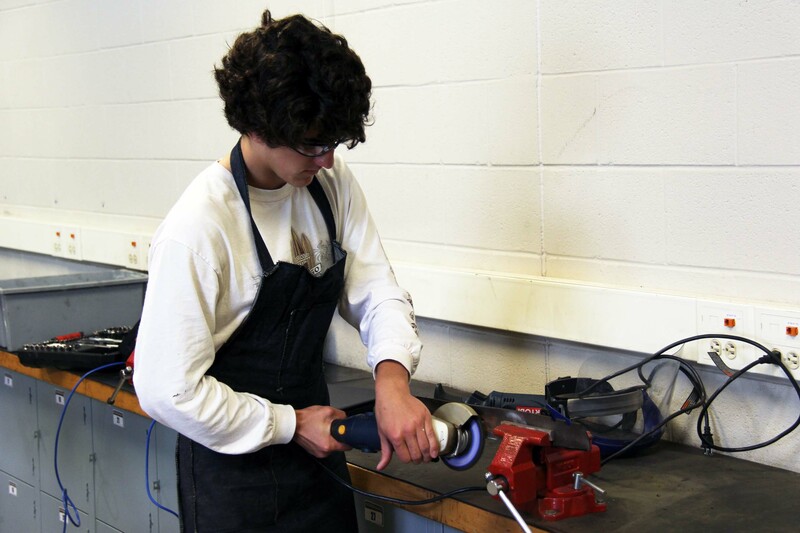 Students have access to equipment specifications, parts lists, unit costs, repower costs as well as training videos and master technician assessments. 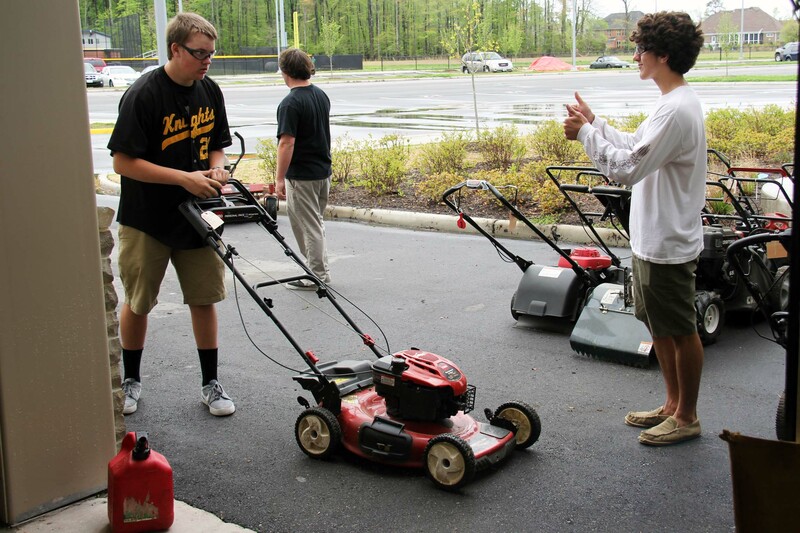 Sophomores John Huston and Christopher Hudson are ready for their first client, and Kennedy issues them a walking mower brought in by Gina Swoope. After noting the client’s name and the equipment’s type, model and code, the team goes through the four steps of a “quick check” to determine if the engine works – verify compression, verify spark, verify oil and fuel levels, and start the engine. When they take the mower outside to check the fourth step, Huston gives Hudson two thumbs up when the engine starts and runs without burning oil or strange noises. Hudson and Huston evaluate their client’s engine. Nick Fallejo and Carter Smith are not so lucky. Their client’s walking mower quickly failed the “quick check,” and they called over Kennedy to provide assistance with next steps. There is talk of an “autopsy” and, if the engine is determined to be beyond economic repair, they will contact the client. Any non-functioning equipment the class is able to keep is disassembled with sustainability in mind. Having determined their lawnmower runs, Huston and Hudson work through a more detailed analysis of the engine to evaluate 17 additional items on the work order: visual inspection, ignition cut-off function, spark plug connection, compression test reading, leak down test, starter rope check, blade condition and so on. When the blade proves dull, Kennedy calls everyone over for a lesson on how to sharpen a blade. “Why do we want the blade to be sharp,” Kennedy asked the group surrounding him. “We want to cut the grass, not beat it to death. And we don’t want to tear it or cut it too short. These wings here channel the air to keep the grass standing up so you can cut it.” After Kennedy’s demonstration, the technicians go back to their respective companies, and Huston takes a turn to sharpen the blade on his client’s lawnmower. “I have definitely learned a lot about measuring. 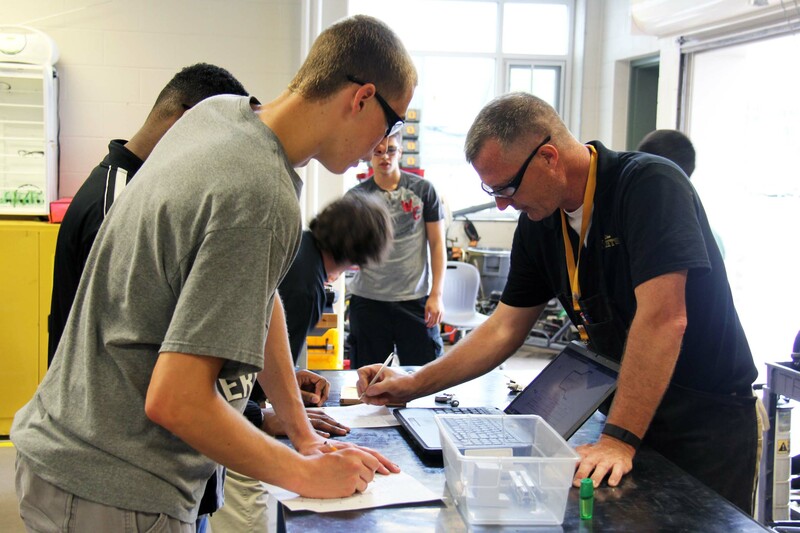 I never would have known how to measure an engine,” said Huston of his classroom experience. “And he has taught us little tricks that will help us with repairs,” acknowledging that the information may help Huston avoid having to pay a mechanic for his own repairs down the road. Huston’s reflections and the hands-on learning and problem solving in which he and his classmates are engaged are why Kennedy enjoys his job. Congratulations, Tim! What a great article. It’s always a pleasure to walk by your room to see every student engaged and enjoying the hard work. Keep it up! What a wonderful article! Way to go Tim for teaching something engaging and valuable that they can use in every day life! And this is probably the class the students will look back on fondly because who doesn’t like taking things apart. And, oh the reward of putting back together better than it was. Solid, practical learning. Way to go, Kennedy.